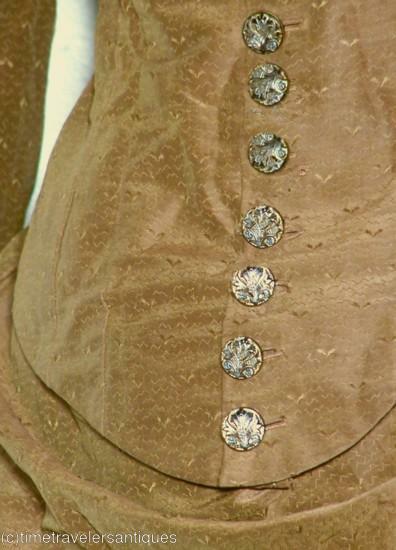 A most becoming original circa 1885 lady's rich golden brown silk brocade two piece bustle dress with a lined bodice having 18 matching ornate floral gold and silver colored glass buttons to the long front closure, and a double inverted pleated tail. The brown polished cotton lined skirt has an attached fashionable pleated draped overskirt, a pleated waterfall bustled back, and a complimenting pleated ruffled hem. 15" from shoulder to shoulder, a 34" bust, 24" waist and 54" from shoulder to front hem. In very good clean sound as found condition, with extremely minor underarm color that you really have to look for, a period reinforced waistband at he back opening of the skirt with no fastener, and just a few pin dot age flaws. 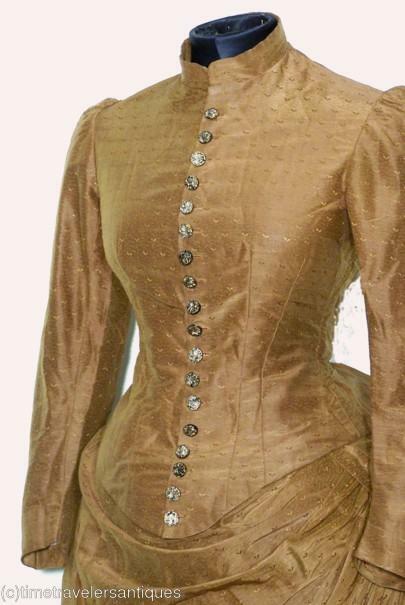 A very fine Victorian bustle dress.